Aldehydes are among the most synthetically useful building blocks in organic chemistry. The electrophilic carbonyl group acts as a handle for a vast collection of chemical transformations, such as nucleophilic additions with Grignard reagents like those most of us encountered in organic chemistry class. 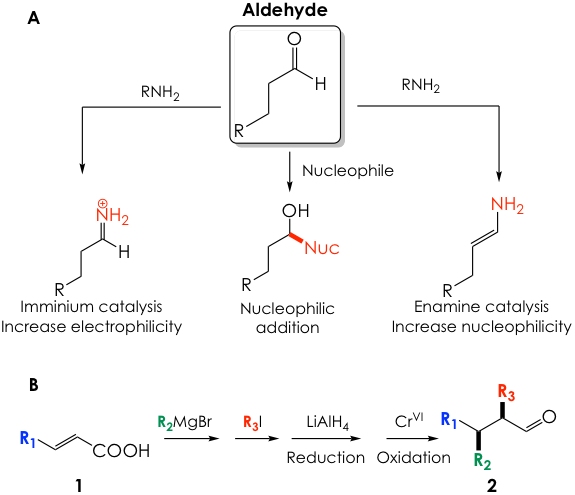 Aldehydes also lend themselves to more sophisticated chemistry such as iminium or enamine catalysis that, respectively, enhance the electrophilicity of the aldehyde or revert its reactivity and turn it into a nucleophile (Figure 1A). It is clear, then, that finding convenient and robust ways to prepare aldehydes is a serious matter for organic chemists. Structurally complex aldehydes with substitutions at the α-carbon (next to carbonyl carbon) and β-carbon (one removed from carbonyl carbon) are highly desirable as precursors for more complex organic fragments but are somewhat complicated to obtain. Because of the inherent reactivity of the aldehyde carbonyl, substituents need to be affixed before installation of such group. A common strategy to synthesize these polysubstituted aldehydes is depicted in Figure 1B, where an α,β-unsaturated carboxylic acid such as 1 is first functionalized at the β position with an organocopper nucleophile and then at the α position with an alkyl halide electrophile. Next, the carboxylic acid moiety is fully reduced to the alcohol and then controllably oxidized back to the aldehyde 2. Altogether, this strategy requires a minimum of 4 steps and utilizes hazardous chemicals, such as chromium (oxidizing reagent) or alkyl iodides. To simplify and streamline the syntheses of these valuable building blocks, David Nicewicz from UNC, Chapel Hill and Yong Huang from Peking University have teamed up to propose a brilliant chemical idea, quite literally speaking. They rely on visible light to transform polysubstituted alkenes known as styrenes (which are generally easier to make or are commercially available) into aldehydes in a single step. The key to this chemical manifold is employing a chemical entity known as a photosensitizer. This type of compound absorbs energy from light, gets promoted to an excited state, and facilitates a chemical transformation of another molecule. Thus, we could envision a photosensitizer to be a mediator molecule that capitalizes on photonic light energy to promote a chemical change in the real target molecule. In this instance, the research group uses a well-precedented photosensitizer known as an acridinium salt 3+ (Figure 2A). Mechanistically, the positively charged acridinium photocatalyst absorbs blue light and gets excited (3+*). In the excited state, it is more willing to get reduced (accept an electron) to the radical 3·, and thus, facilitates the oxidation (loss of an electron) of the alkene substrate 4 to the radical cation 4+·. In turn, 4+· is quenched by an attack from a nucleophilic vinyl ether 5. The resulting intermediate is an oxocarbenium ion 6 that is very prone to a process known as β-elimination, where a general base abstracts the highlighted proton and liberates ethylene in the process to generate the radical intermediate 7. 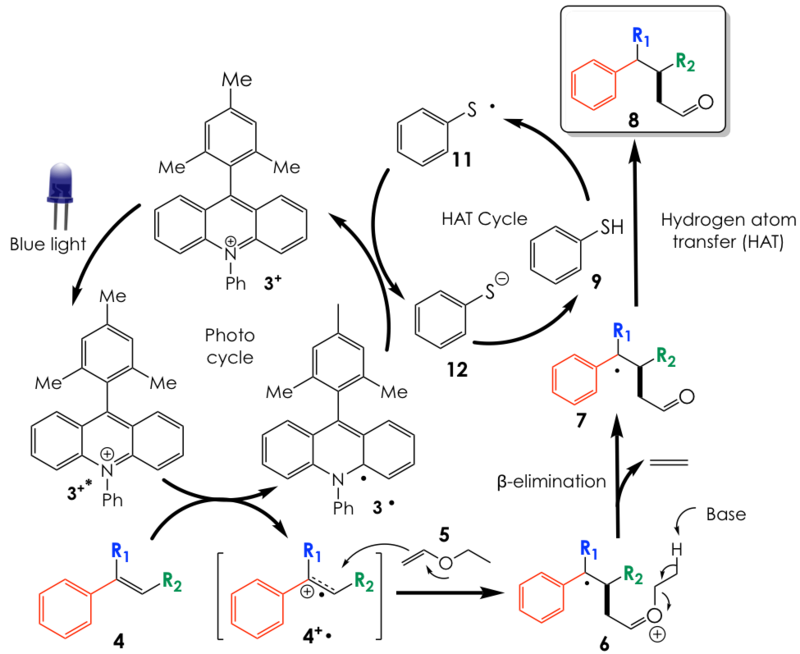 This species is then quenched by a hydrogen atom donor, in this case, a thiophenol 9, to afford the desired aldehyde product 8. A single-electron reduction of the incipient thiyl radical 10 generates the thiolate anion 11 while regenerating the acridinium catalyst from 3· to 3+ for another round of catalysis (Figure 2B). Figure 2: Catalytic cycle for the generation of polysubstituted aldehydes using photoredox and HAT catalysis as proposed by Nicewicz and Huang. The method is overall high yielding and operates under relatively mild conditions since no extreme temperatures or strong acidic/basic conditions are employed. Furthermore, the reactive canvas is highly permissive of several styrene and vinyl ether substrates and is also tolerant groups that would not survive the more traditional route (Figure 1B) such as alkynes or halogens. The curious reader is encouraged to refer to the original article to get further insight into the substrate scope and the mechanistic elucidations. A limitation of the proposed method is that, up to the moment, it is limited mostly to styrenes for the alkene starting materials. This is not surprising since this approach is extremely recently conceived, but styrenes are a good place to start given their well-precedented behavior in radical and photoredox chemistry. Regardless, it is still hard not to praise the authors for the inventive approach they have developed. Using a catalytic manifold for the one-step preparation of polysubstituted aldehydes is admirable, and even more commendable is the use of readily available vinyl ethers as the oxygen source, with the elimination of ethylene gas being an elegant selling point of this method. We can only hope the authors continue developing this idea to accommodate a broader substrate range!